The MAM Mini Cooler with Clip is uniquely shaped to massage soothe sore gums. It is filled with purified water for cooling relief to soothe tender gums. The ring handle makes it easy for baby to hold and the clip keeps the Mini Cooler clean and secure. MAM Mini Cooler Teethers are available at Target, Amazon, buybuyBaby, Publix, and Meijer. Regularly clean the clip with warm water and a mild cleaning agent. Rinse thoroughly. MAM Mini Cooler with Clip Teether, 2+ Months is rated 4.9 out of 5 by 59. 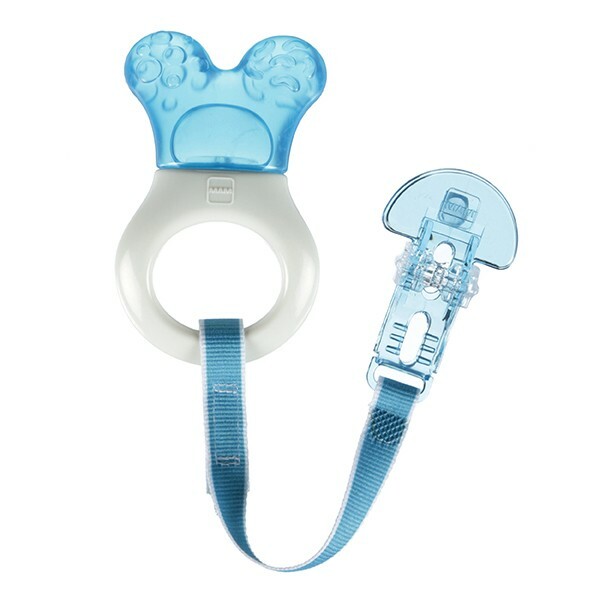 Rated 5 out of 5 by Tammy from Mini cooler teether helped my little girl so much! These mini cooler teethers helped my little girl so much when she was teething. The other cooler teethers I found were just to big for my little girl to get in her mouth but then I found these. It was an absolute perfect fit for my baby. The best part was I was able to clip it to her shirt so it didn’t get lost or drop on the dirty ground & I didn’t have to keep cleaning it over & over again. Once again MAM thank you for saving my little girl.